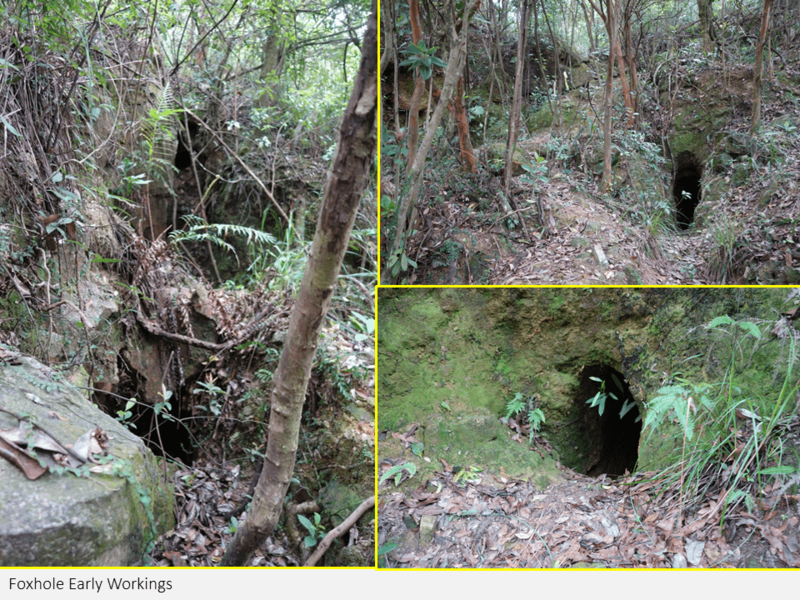 Tymon Mellor: One hundred years ago this year, according to records, mining for Wolframite (or Wolfram as it used to be called), commenced at Needle Hill, possibly one of the oldest and most extensive industrial historical sites in Hong Kong. The mine workings now lie abandoned and overgrown on the hillsides above the Lower Shing Mun Reservoir. 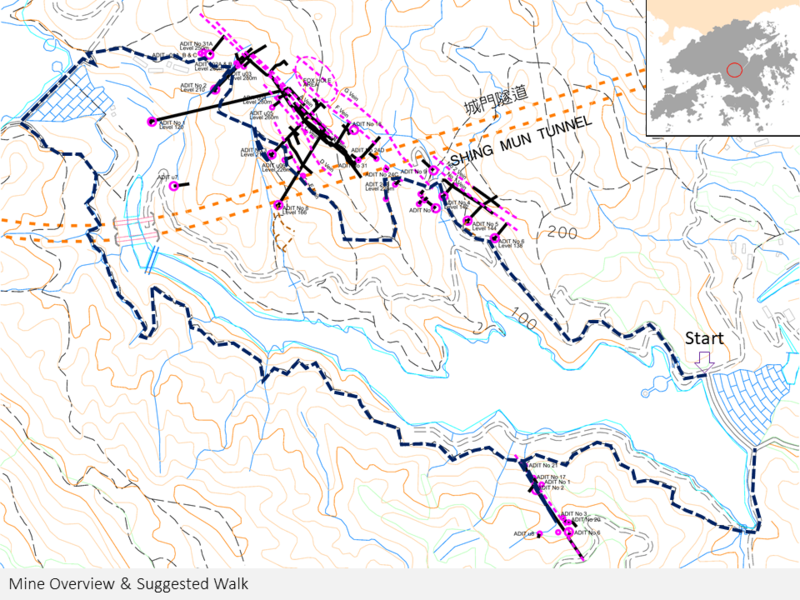 If you have a spare few hours and wish to explore a little of Hong Kong mining history, I’ll take you on a 7km walk around the old mine workings and describe their history. 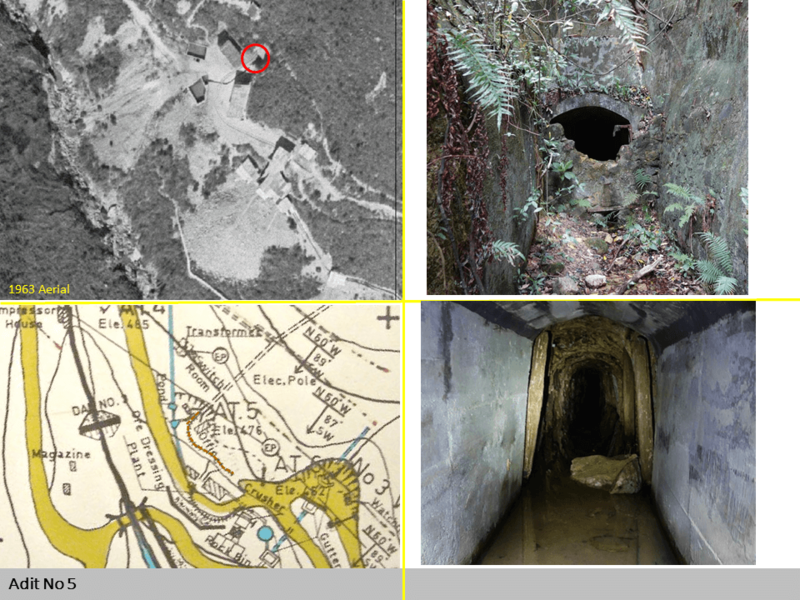 This article will discuss the abandoned mine workings of Needle Hill. 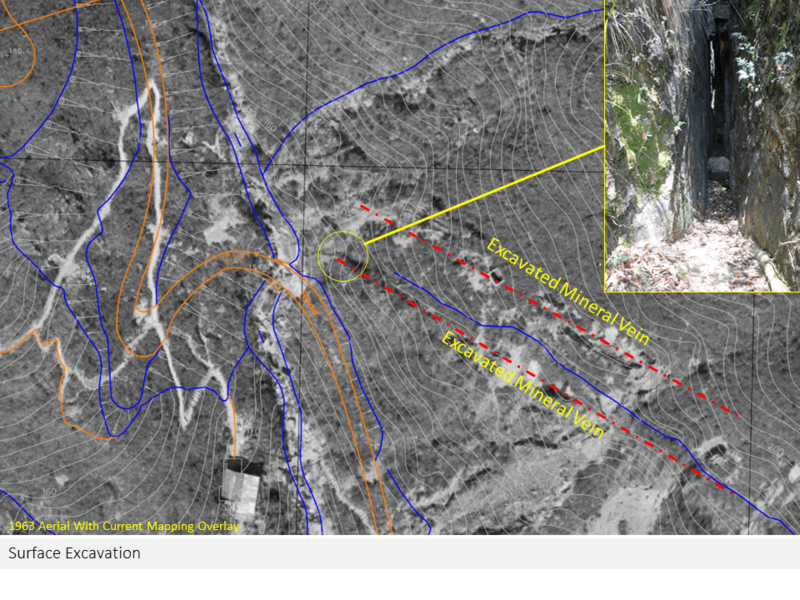 The workings are extremely dangerous with unsupported tunnels, open shafts with mine waste stored above te roadways. The workings should not be entered. We start this exploration on the crest of the Lower Shing Mun Reservoir dam, completed in 1965 by the Nishimatsu Construction Company as part of the Plover Cove Reservoir Scheme. The 56m high dam can impound around 4 million m3 of water. The reservoir is used to balance water flows and avoid down-stream flooding in Tai Wai. Looking north-west you can see the steep narrow valley with the slopes of Needle Hill dropping into the Lower Shing Mun River, with only the WSD access road to provide a safe route around the man-made lake. This is Wolframite country. The ore is found in a series of near vertical Wolframite-quartz veins running in a north-west/south-east orientation across the valley. Wolframite is the a highly valued mineral and the natural ore of the metal Tungsten, a strong and quite dense material with a high melting point, used for electric filaments and armour-piercing ammunition along with carbon for machine tools. Thus, in time of conflict Wolframite is a strategic asset. The mineral, WO4 is found as dark prismatic crystals in quartz veins and with a specific gravity of 7 to 7.5 is over twice that of the surrounding material simplifying the extraction process to segregation by density. We follow the WSD road around the reservoir, rising up the hillside as we go. Before the construction of the lower dam, free-lance miners used to earn a steady living panning and sluicing the river bed for Wolframite that had been deposited in the stream bed. The mineral washed into the streams from the natural erosion of the quartz bearing veins or debris from the mine workings. At around 800m along the road, the roads turns to the left and descends down the hill, with a smaller road carrying on up the valley, and if you look carefully there are signs of the old mine workings; stone walls, half buried adits and eroded hillsides. You can now step back to the winter of 1917 when after an extended drought the recently started mining works at Ling Ma Hang were suspended as a result of a shortage of water. 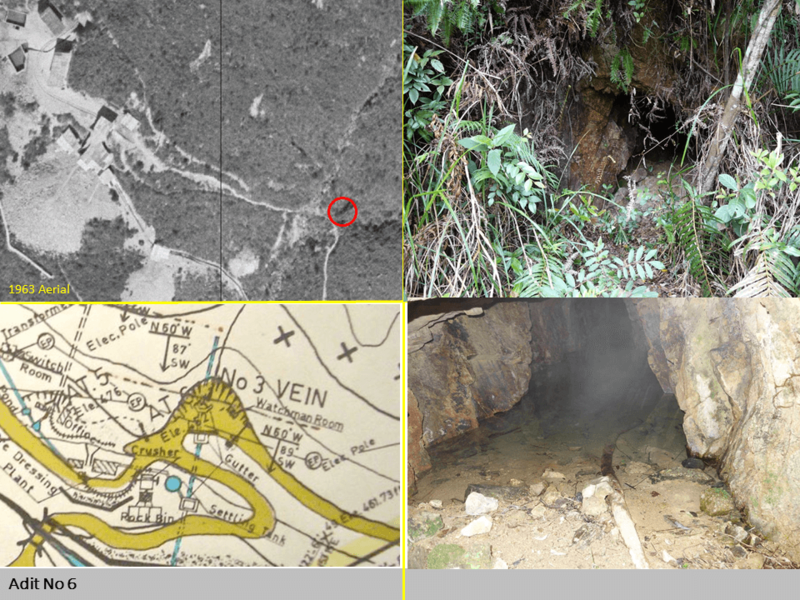 It is not recorded why, but the under-utilised miners turned their attention to the slopes on Needle Hill, digging the exposed quartz intrusion and exploratory tunnels into the veins of quartz bearing Wolframite. As noted in the Report on the New Territories for the Year 1917, “at the end of the year about 200 coolies were at work”. An un-published report by Davis indicates that the mine was under the control of Sir Paul Chater operated by an Anglo-American syndicate whom had a five year Government lease expiring in 1922. In October, 1921 a newspaper article noted that six out crops of tungsten bearing ore had been found in the New Territories of which three had been developed, yielding ore containing 18% of tungsten. The veins were described as “10 to 18 inches in thickness. According to the US Consul-General, George E Anderson, ‘it is altogether within the range of possibility that the deposits are amongst the most important in the world.’” A report in June, 1920 stated, “The output from the Needle Hill mine averaged about 30 piculs of Wolfram ore per month [in 1919]”. The unit of weight, the “picul” was a practical measurement based on ability rather than science. It was “as much as a man can carry on a shoulder-pole” (Wikipedia), one assumes two baskets on a shoulder pole. The unit was standardised in Ordinance No. 22 of 1844 to a modern equivalent of around 60.5kg. The initial workings would have been high on the hillside where the mineral vein could be located close to the surface. The method of mineral extraction was rudimentary, utilising water to wash away the soil to expose the mineral vein through a process called ground sluicing, followed by trenching or excavation of short ‘fox hole’ tunnels to extract the Wolframite bearing quartz veins. The remnants of this approach can still be seen high in the hills as we walk around the workings. Following the end of The Great War, the demand for tungsten dropped along with the price. 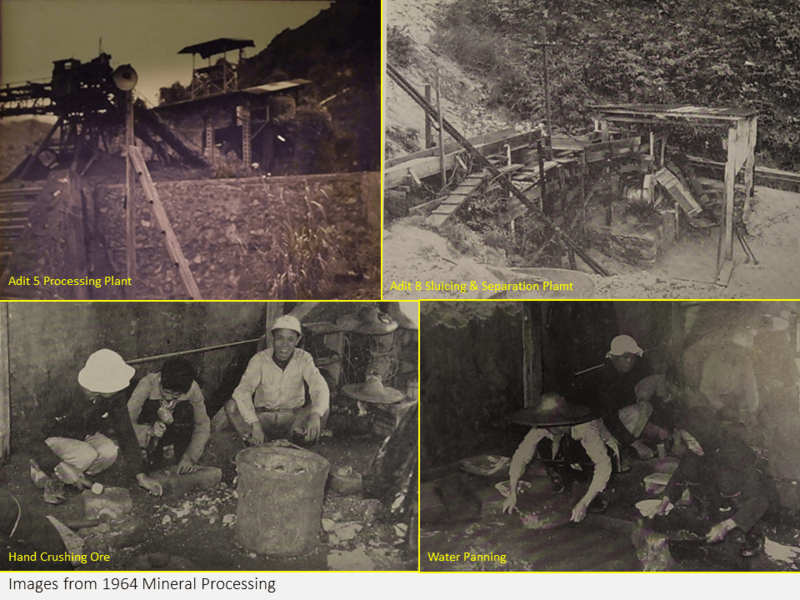 Work at the mine was intermittent, with the concession passing into the hands of a local Tsuen Wan resident Mr Lee Kwai and subsequently to Messrs Wong On & Wong Bin. As you look around the road junction you can see a stone wall on your right. This used to be the headwall of a rock crusher where excavated rock was tipped into a hopper to feed a dressing plant and rock bins. The remnants of which are visible if you follow the road down the hill. To the right of the wall are two adits, Adit No. 6 and an un-numbered adit. The latter was probably excavated to establish the extent of the mineral vein. On the left of the stone wall are a set of concrete stairs, and these take you up to a narrow plateau where rail tracks linked the tunnel to the crusher. Follow the path until you reach the foundations of the mine buildings and Adit No. 5 tucked in the corner. Excavation of Adit No. 5 started in July, 1937 and production from this site continued until the closure of the mine in 1967. Unlike all the other mine entrances, No. 5 is set back in a cutting, and this is because of an event on the 20th July, 1937 when after heavy rain the timbered heading collapsed, trapping two workers and resulting in the death of one, Mr Wai Sap-Luk. 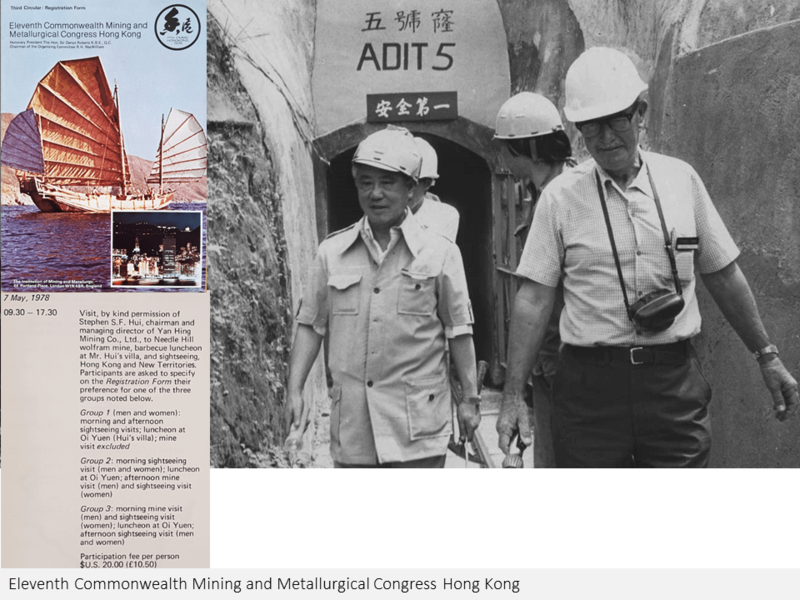 The adit was also used for a mine visit as part of The Eleventh Commonwealth Mining and Metallurgical Congress Hong Kong held in 1978. This event was hastily re-located to Hong Kong as the original host nation, South Africa was subject to anti-Apartheid pressure and ultimately sanctions making it unavailable for the event. On the 17th August, 1929 a mining application was made to the Government for the licence, “covering one square mile near Needle Hill”, from Mr J P Kim, a representative of the National Commercial Company Ltd. Mining licence number 10 was subsequently issued in 1930. The internet does not record the details of the company, but the David Webb website advises the company was formed on the 25th July, 1924 and was the 679th company to be incorporated in Hong Kong, but it was dissolved in November 1934. Confusingly, there was a second company with a similar name, National Commercial Company, Limited (The), the 406th Hong Kong Company to be incorporated. Hopefully there is no confusion in the records! The request was for mineral extraction and it subsequently became clear in a follow-up letter of the 30th January, 1931 what was going on. From the discovery of the mineral in 1917 to 1923 the mine was worked “intensively” excavating the mineral veins until, “nearly all the upper level were worked out or had caved [in]”. Starting in February 1930 Mr Kim and his team mapped the mineral veins and excavated new tunnels below the old workings to confirm the size and quality of the ore. These are likely to be the smaller adits high on the hillsides, number u1 to u6 on my drawing. 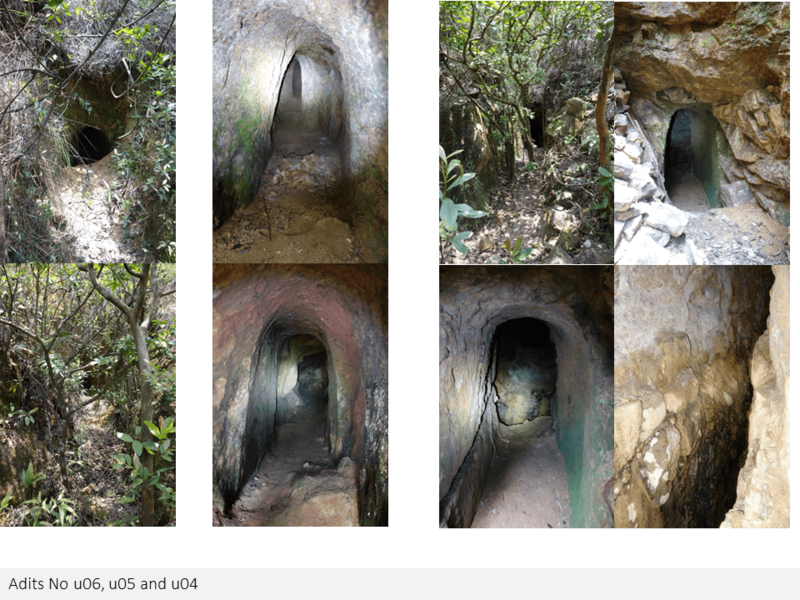 These are not indicated on the available mine drawings where all the entrances are lower down the hillside. With confirmation that the deposits still contained workable quantities of Wolframite, Mr Kim wanted to extend the licence beyond the original two years, but like so many others before the market had dropped significantly and with an investment of $40,000, Mr Kim was seeking relief on the royalty (5%) on the minerals already extracted. It would appear that the Government did not acquiesce to Mr Kim’s request and the company was dissolved in November, 1934. From Adit No. 5, re-join the road and walk up the hill. The original access road contouring around the hillside was constructed in 1963 to provide vehicular access to the mine working. The road heading up the hill was was constructed in 1965 by the Yan Hing Mining Company, the then mine operator, to provide access to a new quarry at the top of the hill. The excavated rock was crushed and used in the construction of the Lower Shing Mun dam. Just before the stream road bridge, on the left hand side is Adit No. 4. Unlike the lower adits, this connects into mineral vein 1, but not to vein 2. Given that the mine adits appear to have been numbered sequentially as they were constructed, Adit Nos. 4 and 5 were started in late 1938 but was said to be fully developed by the Japanese during the Pacific War. To the left of the river, just beyond the bridge, you can climb a short slope to see the mined mineral vein. The ore has been mined from the surface along the length of the vein. 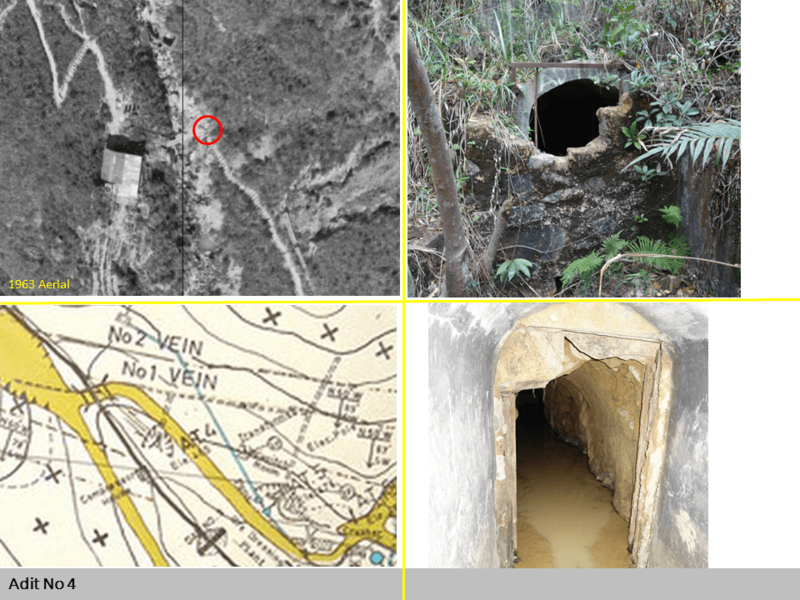 Given the sequence of the mine entrances, veins A to G were the initial discoveries, with vein 1 and 2 being developed just before the Pacific War. In July, 1934 the Government invited tenders for a 12 month mining concession for Needle Hill for an annual fee of $2,500 along with the 5% royalty. However, it would seem this was not attractive to the market and ‘privateers’ continued to exploit the site. During 1934, a monopoly on the supply of Wolframite was established in China, raising prices and making Needle Hill once more profitable to mine. 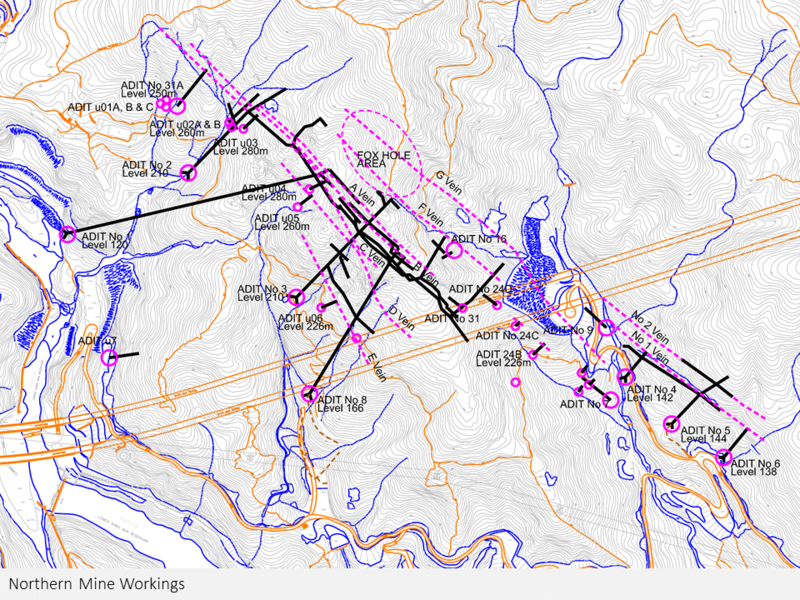 Illegal operations took off with mining the ore where ever it could be found. Two murders were reported arising from quarrels over the proceeds and then in November, 1934 Mr Wong Ping, a mine owner at Needle Hill was killed during a robbery netting $120. The following year, 30 catties of ore were stolen by a coolie of the No. 7 mine at Needle Hill, and a $75 fine was imposed. By the summer of 1936, the Government awarded a 21-year lease on mine lot no. 9 with 540 acres of Needle Hill, to Marsman Investments Ltd of London, from the 9th May, 1936. Seven months later, on the 9th December, 1936 Marsman Hongkong China Limited was formed with the purpose of “engaging in the industry of mining in all its phases….carry on business as consulting engineers to any government or state or municipal or other body in civil mechanical and electrical engineering”. The Managing Director of this new company was to be Mr G B Gifford Hull, the engineer responsible for the construction of the adjacent Shing Mun Reservoir. The mining lease for Needle Hill was subsequently transferred to the local company representation in March, 1938. 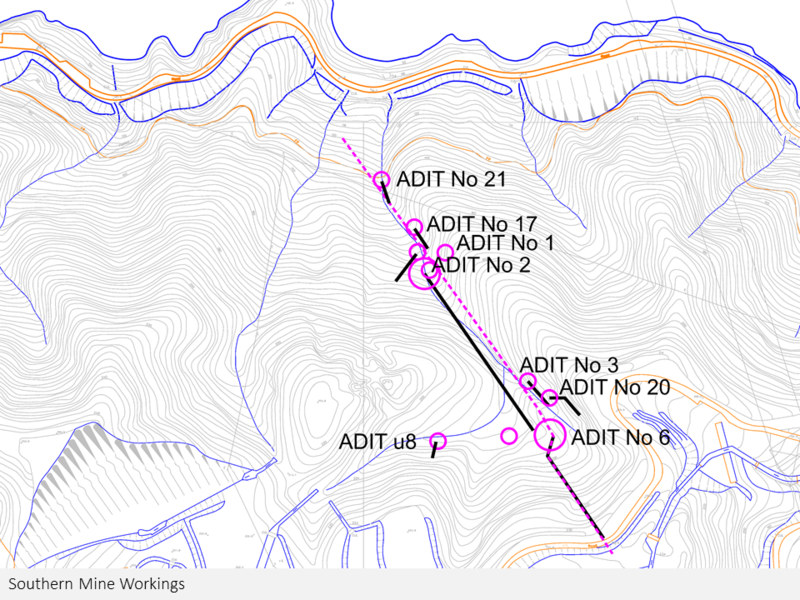 Following a survey of the site, two adits were initially excavated to intersect the mineral veins with, Adit 1 at 338m long and, Adit 2 at 170m long taking four months to drive. Adit 1 was driven from the bottom of the valley at 120m level and Adit 2 at 210m level, and the results were disappointing; although Adit 1 found the vein there was not Wolframite, the mineral was limited to the upper levels, and on this basis it looked to have less than two years of production. A third adit was excavated at the 210m level, and Adit 3 at 180m long was connected to Adit 2 with a 240m long drift. The total cost of the development work was $80,000, but now production could commence. By 1938 the company had extracted 1,640 piculs of Wolframite. Returning to the road, continue up the hill until the road bend rights towards the hillside quarry. On the left is a small path, the old miner’s path between the different working areas. The path winds its way up the hillside with collapsed tunnels on the left, indicating the presence of adits below seeking the mineral vein. At the 190m contour, the path flattens out to follow the hillside around to the south, turning west then north as it follows around the headland. Blind excavations are passed along with a pylon for the CLP over-head-lines. An adit is passed that is not blind, this (numbered u6) indicates that we are back above the vein. At the next major junction, turn left down the hill and follow the mine trail until it opens out to Adit No. 3. Adit No. 3 was probably the most successful of the pre-war operations. It provided access to multiple veins, all providing high quality ore. In 1938 around 500 coolies were working at the mine, women and children on the surface and men underground. They lived in purpose built accommodation, described as a “fine and expensive coolie lines”. It was considered palatial at the time, where mat houses were all that was needed. The mine was run using subcontractors, each one operating a different adit and being paid between $82.5 to $95 per picul. Marsman, provided all the facilities such as plant, electricity, explosives, transport and accommodation, raising the production cost of the ore to $120 per picul. We know these details as a consequence of a fatal accident at the Ling Ma Hang mine in early 1938. Five men were killed by rock falls and along with the problems of illegal mining the Government decided to undertake a review of mining policy and practices. The Senior Inspector of Mines from Malaysia was invited to inspect the Hong Kong mining operation and provide recommendations on how to improve the Hong Kong mining industry. He submitted his report in September, 1938 but nothing was to come of his recommendations until after World War II and following the formation of the Mines Department in October, 1951, along with new regulations in 1954 replacing the 1906 mining ordinance. By the time of the outbreak of the Pacific War in December 1941, the mine was averaging 7 tonnes of ore a month with 65% Wolframite content, and Marsman had extracted a total of around 400 tonnes of ore. The operation of the mine used the sub-level open stoping method where by the mineral vein was excavated from the bottom, allowing the blasted material to fall and be collected and removed through the two adits. With the cross connection between Adit 2 and 3, this ensured good ventilation within the workings. The ore was hand sorted off a belt conveyor, then machine crushed, followed by preliminary sluicing and hand picking of mineral nuggets. The rejected material was passed through a hammer mill to pulverise in to rock, then sluicing, jiggering and hand-panning for final concentration and drying. The mine was abandoned on the 9th December, 1941 when the advancing Japanese military took control of the area. With the support of the Taiwan Development Company, the mine reopened in July, 1942 and re-commenced operation extracting 10 to 12 tonnes of Wolframite ore a month for shipment to Japan. The Taiwan Development Company was established in 1936 to assist in the economic development of Taiwan, becoming the largest landholder on the island. What was not known at the time was that the company was Japanese owned, holding 90% of the shares in 1939. 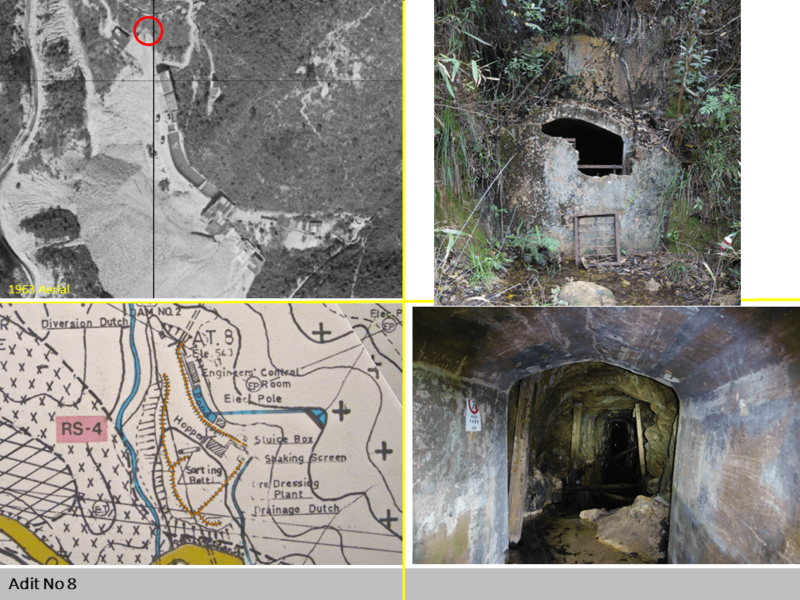 In early 1945 the mine was once more abandoned by the Japanese ahead of the re-occupation of the Colony, with the departing owners stripping the mine of all equipment and installations. From Adit No. 3 the mine trail continues steeply down to Adit No. 8, but unless you wish to walk back up the hill, we will pass this by. Adit No. 8 is one of the post war adits and one of the last to be operated at the mine. The entrance to the adit also sits directly above the modern Route 5 road tunnels (Shing Mun Tunnels) constructed in 1986 by Dragage et Travaux Public. During the design of the new road tunnels, there was concern that the new excavation may intersect the mine workings. At the time, the mines had been abandoned for nearly ten years and records of the old workings were found to be unreliable. In 1984 the lower levels of the mine were pumped out and a survey inspection was undertaken by Mott, Hay and Anderson Far East. They concluded that the mine workings could be within one metre of the new tunnels, and recommended the lower levels be backfilled with concrete. This work was undertaken and the tunnels sealed. Supporting Adit 8, was the flushing and dressing plant needed to process the ore before removal off site. Before the road was constructed in 1964 all materials had to be carried into the valley and the product carried out over the Shing Mun Dam and down into Kowloon. Even with the new road, the area was classified as a Closed Area, requiring a permit for all workers and vehicles to enter the area. During the initial months after the end of the Pacific War, illicit mining resumed at the site by mainland Chinese miners and local farmers, much to the frustration of Marsman. It was not until December 1947 that control was gained over the area by the authorities. With ten years remaining on the mining lease Marsman planned to invest in the mine, a newspaper article from December 1947 states, “Modern American machinery soon will be pitted against coolie brawn in a contest of efficiency”. After a six-month period of remapping the area and the old workings, production resumed in February, 1951. The mine was being “energetically developed” by labour compradors, but there was a limit on the availability of labour and the continuing declining price of the Wolframite ore scuppered plans to mechanise the workings. In early 1953 Marsman entered into agreement with a newly formed company, Hoong Foo Mining Company Ltd (formed in March, 1952) to operate the mine with up to 2,000 minesr and partial mechanisation. Working multiple veins and with the improved access, production reached 250kg/day. A breakdown of the annual production during this time is shown below. In addition to the extracted Wolframite, nearly 0.5 tonne of Molybdenite ore, in the form of lumps at 37.7% Molybdenum was also mined. With the outbreak of the Korean War and the turmoil in China, supplies of Wolframite were limited raising the price of the ore, peaking in October 1953 at HK$850 per picul. With the conclusion of the Korean War, the price of ore dropped to only HK$240 per picul by February, 1954. With the substantial drop in ore price, the mine was closed in October, 1955 as Marsman negotiated the sale, and Government approved the assignment of the leasehold property to the Yan Hing Mining Company Ltd (formed March, 1954), completing the transfer in early 1956. From Adit No. 3, head back up the hill to the contour mining path and follow this over the small stream. Above the contour path, some 50m higher up the hillside are a series of entrances and short adits connecting to the mineral vein. 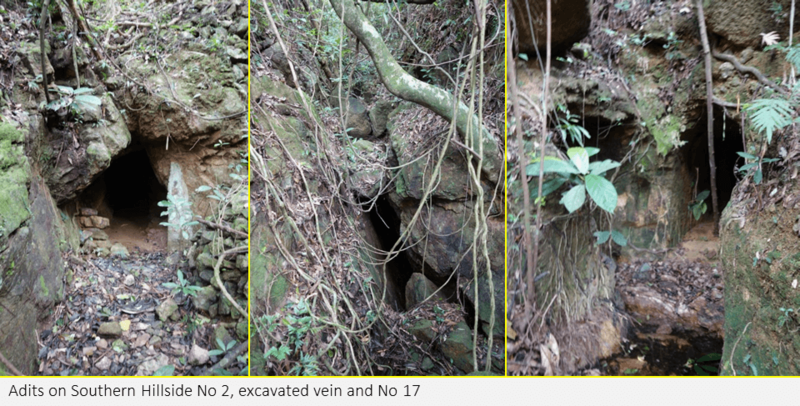 The entrances are not shown on the Yan Hing mine drawings, suggesting they do not form part of their works. These probably originate from the Kim development and would have been exploited as part of the illicit mining. These adits are particularly dangerous as the vein has been fully excavated leaving exposed vertical drops. Continuing along the path, the trail crosses a number of streams and on the left a small path can take you down the hill, alongside the a stream to Adit number 2. 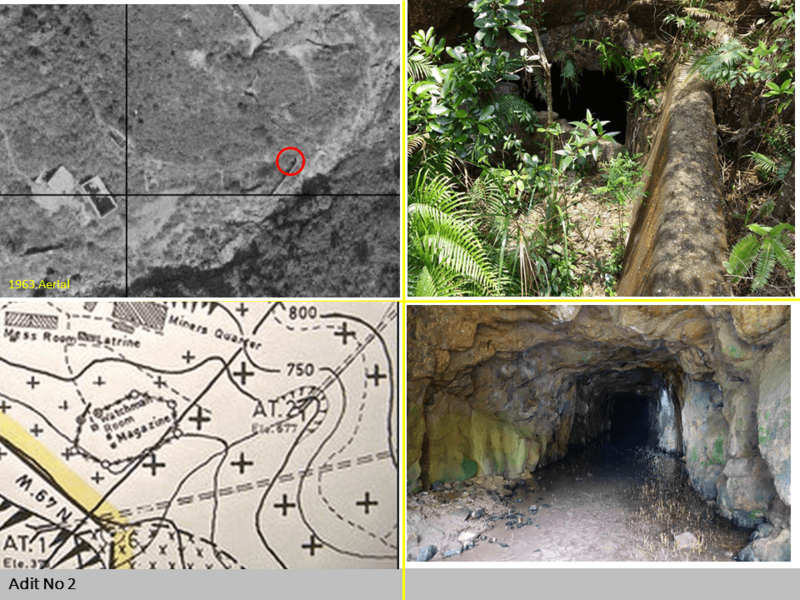 This was the first adit developed in 1936 that encountered the Wolframite ore and would have been extensively worked before and after the Pacific War. The adit is next to a mountain stream separated by a stone wall to prevent flooding. Returning to the contour path, more entrances can be seen higher up on the hillside along with excavated spoil. The path then enters the former workers accommodation site. All that is left are the remnants of the main buildings, steps connecting the levels and a sense of lost history. There are no historical markers or plaques to give recognition for the site and the contribution the mine and the workers have made to the development of Hong Kong. Leaving the village behind, you suddenly find yourself on the MacLehose Trail (Section 7), back on wide paths with well equipped athletes preparing to tackle Needle Hill. Head down the path and cross the Shing Mun Dam, enjoying the view down the valley and try and spot the route and the mine entrances on the wooded hillside. At the end of the dam is the plaque erected to celebrate the completion of the dam, a major feat of engineering and the subject of a separate article. Turn left to pass through the picnic site and take the path heading down the hill to join the catchwater and contour path at around the 150m level. Stay on the path all the around the south side of the reservoir back to the Lower Shing Mun Dam. The Yan Hing Mining Company re-commenced operations of the mine in 1956 on a much smaller scale than previously adopted; by the early 1960’s there were only 50 miners working on site, with half working underground. The miners were excavating 30-40 tonnes of rock each day, recovering around 4 tonnes of Wolframite a month. The company believed that with improved adits and haulways with a team of 125 miners could profitably produce 15 tonnes of Wolframite a month. 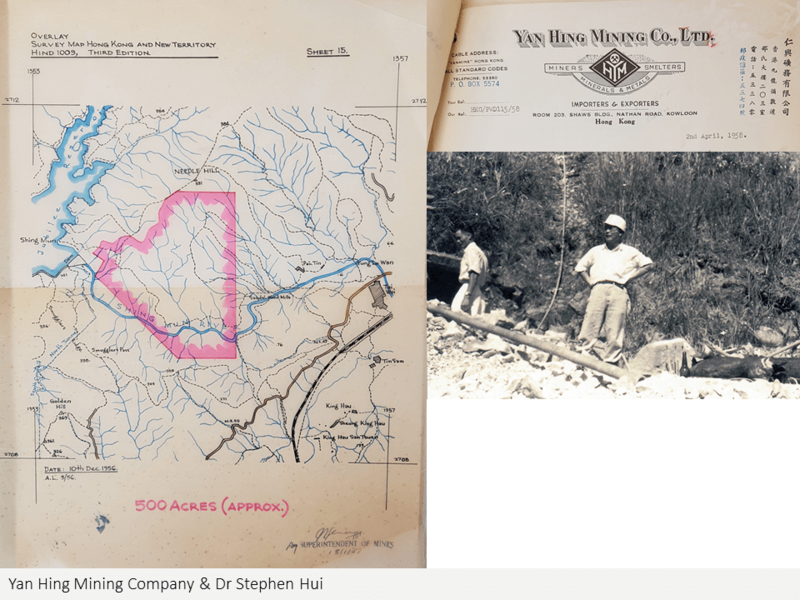 On the 10th May, 1957 the Yan Hing Mining Company, was formally awarded a 21-year mining licence for Needle Hill, mine lot number 21 on the completion of the previous licence. The chief mining engineer and General Manager was Dr Stephen Hui, a US trained mining engineer. He was well respected in the industry and an avid collector of minerals and rocks. On his death in 1989 his collection was donated to HK University to form the basis of the Stephen Hui Geological Museum. Between 1956 and closure of the mine in 1967, around 223 tonnes of Wolframite concentrate was produced using traditional mining methods. With the price of Tungsten ore continuing to decline the mine ceased production in 1967. With the mining licence expiring in 1978, the company undertook a review of the mine reserves and identified ore concentrate of 2,272 tonnes (69.6% Wolframite), sufficient to keep the mine operational for 15 years if the price was to rise again. Continuing along the path on the southern side of the reservoir, the path winds around the hillside, occasionally providing views across the reservoir. Opposite the mine workings on the north side of the valley, Wolframite mineral vein was discovered and exploited. 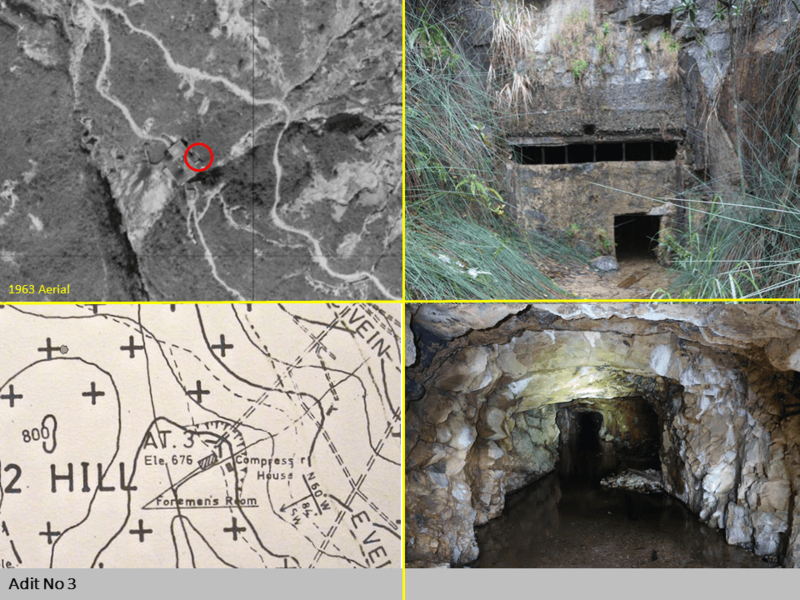 Very little has been documented regarding these workings, however, based on the adit number systems it is probably the vein which was identified before the mine resumed operation in 1951 by Marsman. To achieve the high production volumes of the following years, additional working faces would be required, and these would probably be adits 17, 20 and 21. The remaining adits were probably developed by Yan Hing. It is something of an adventure to visit these adits, climbing up the river bed to find the adits. It soon becomes apparent that the mineral vein has been excavated down from the surface and the river runs through the deep narrow canyons. The area is heavily wooded with no obvious paths, just drops and workings following the mineral line. Returning to the path, this can be followed until it descends to join the CLP and WSD access road, then along to the dam and the end of our walk. As you return to the dam and look up the valley you can remember the thousands of workers who have toiled in difficult and dangerous environments to mine the mineral ore from deep within the mountains. Needle Hill mine operated for 50 years from 1917 to 1967 providing opportunities to the new residents of the territory and earning important revenue for the Colonial Government. Records of the mineral production are incomplete but I have pieced together an estimate based on the available records and an estimate on the extent of the mined excavation. Over the course of the 50 years of operation over 200,000 tonnes of ore was removed yielding nearly 1,500 tonnes of Wolframite ore at a concentration of 65%. Based on todays prices of around HK$95,000 / tonne, the total value extracted from the mine during its 50 years of operation was around HK$140m. Not a great investment. 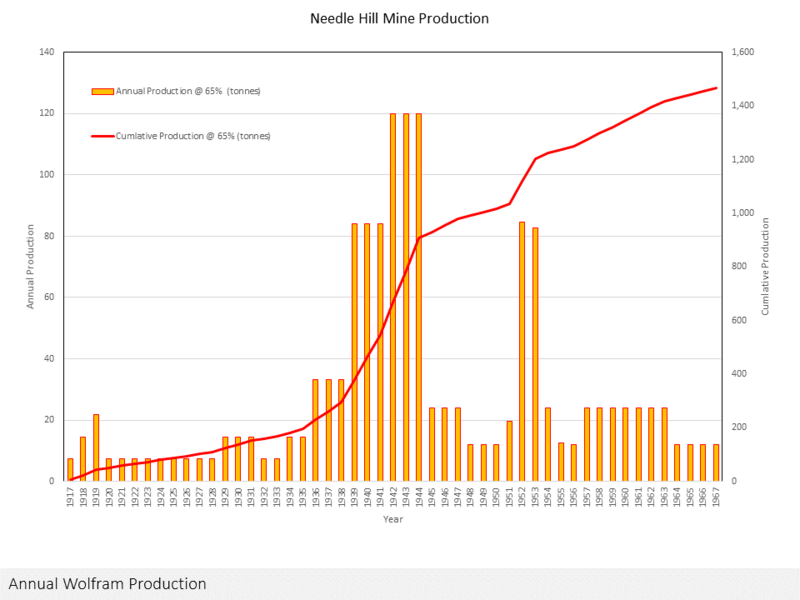 A detailed breakdown of the assumed mine production is shown below. Now the entrances and adits lie lost in the undergrowth, passed only by keen walkers or the adventurous visitor. They are remote and dangerous, but carry with them over one hundred years of Hong Kong industrial history. The mine workings of Needle Hill grew and contributed to the development of Hong Kong, and deserve their recognition and contribution to the development of the territory. The Geology and Exploitation of the Needle Hill Wolframite Deposit, K J Roberts & P J Strange, Geological Society of Hong Kong Newsletter, 1991. This article was first posted on 28th September 2017.